In this lesson, we will learn how to start your own seed with Rockwool Cubes. Below is a detailed guide to success with Rockwool, and a step-by-step video tutorial can be found at the bottom of the page. Rockwool Cubes have a PH of roughly 7.8. This is pretty alkaline, yet our plants prefer to grow in a slightly more acidic environment (between 5.5 – 6.5). In order to prepare our Rockwell cubes for the seeds, we need to soak them in some PH adjusted water, that way they have everything the seeds need to germinate and sprout; water and a slightly acidic environment. Get a bowl or some other container that is big enough to fill with water and have room left for your Rockwool cubes. Your average salad bowl will work fine for 3 Rockwool cubes, if you are planning on doing more than you will need a larger container. Fill the container/bowl with water from your tap. You may also choose to use water filtered through a britta or reverse osmosis (R/O) water, I’ve had success with all 3 of them so whichever you have on hand will work fine. Using either a PH test kit or a Ph meter, determine the Ph of the water. Water comes out pretty alkaline, usually around 7.4, so you will need to acidify it a little bit to bring that Ph down to the desired level. Aim for as close to a Ph of 5.5-6 as you can get. To accomplish this, use either Ph down chemicals, or lime juice (as it’s acidic). Add these to the water in small increments (VERY SMALL), and test the water to see where the Ph is. Continue doing this until you have a Ph of 5.5-6. Now that we have the Ph adjusted water, it’s time to stabilize and hydrate the Rockwool cubes in it. Insert the Rockwool Cubes into your container and let them soak for roughly 1 hour. Once the hour is up, the cubes will be big and fat with water. Take them out of the bowl of water and put them somewhere you don’t mind getting a little wet. Save the remaining water for step 3. Rockwool Cubes are designed to maintain the correct water to air ratio and squeezing them may damage their structure. Some of the marijuana forums advocate doing everything from squeezing them completely dry, all the way to flinging them around like paintbrushes in order to get excess water out. None of that is necessary, leave it as it is. It will stay moist for several days without needing to be watered this way as well. On top of that, Rockwool is like asbestos, you don’t want to be squeezing it or breathing it or generally touching it any more than you need to. Here is a good article on some of the health concerns of Rockwool. I use it because it is what works best, but be cognizant to the fact that it is a potentially dangerous substance to be making contact with so don’t do anything more than you need to with it. Most Rockwool cubes come with holes in them, if yours did not, than create a hole in one side that is approximately a quarter inch (0.75 cm) deep. Take 1-2 seeds and insert them carefully into the holes. Use a toothpick or similar object to push them down to the bottom, as you want them to be at the bottom of that hole. Rip or push a piece of the Rockwool over the hole (you don’t have to fill it completely), so that the seed can germinate in a dark moist environment. Now, if you can, place them in a tray with a dome on it. This will help create a little humidity in there which seedlings like. This is not mandatory, but it helps. Whichever you choose, take your cubes and put them in a cool dark place, and leave them alone. The temperature should be roughly 68 degrees F, though my house stays at about 72 and they do fine there. I usually place them above my refrigerator and just leave them for a day or two. My lettuce seedlings sprouted with a quickness the last time I tried, and by the 3rdday they had grown so tall that I had to take the plastic dome off of my container because they were bumping up against the ceiling. If you put more than one seed in your cube (just in case one didn’t make it), than you probably have several seeds sprouting up in each cube at the end of ~3 days. Once the first true leaves emerge, we want to select for the strongest one (the one that grew the tallest), and cut off the tops of all other seeds that are growing next to it. Do not pluck them out, as you may uproot it’s neighbors. Simply cut it off as close to the hole as you can without messing with the stronger one that you plan on keeping alive. Depending on how hot it is (and other factors) you may need to water your cubes 1-4 times a day. Use the Ph adjusted water when doing so (that’s why I had you save the leftovers from step 2). If you already threw that water out, go make another batch of Ph adjusted water and keep it in a separate bottle or container for watering. Note: Do not over water, in fact while some say to water 1-4 times a day, I did it only once a day when I got home after work. Some people claim they use a diluted nutrient solution to water their Rockwool cubes with during germination. Do not do this, as my experience has always been negative. Note the picture below, where I did an experiment by adding a very diluted grow nutrient to the Rockwool cube on the far left. It died within an hour or two, and the others went on to live happy lives. 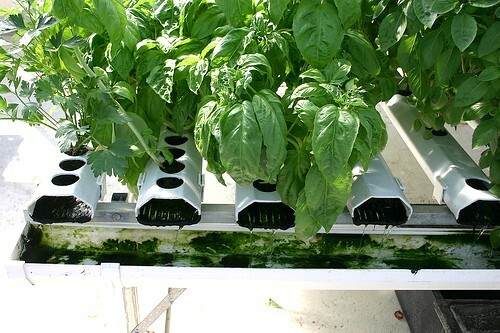 In my opinion, they do not need nutrients until they get into your hydro system. Do not add any nutrients to your Rockwool Cubes. The one on the left got nutrients, the other two did not. About 2-3 weeks after germinating, you are ready to transplant these babies into the hydroponic system of your choice. A good rule of thumb to go by is that you want to transplant them once the first roots begin poking out of the Rockwool cube. Don’t wait too long though, as eventually the roots will begin tangling around the cube since it is their only source of water. You want to catch them right as they pop out, so that when you transfer them into your hydro system the roots will grow down into the system, and not just try to feed off the Rockwool cube alone. If you have any questions, suggestions, or comments, please leave them below and I will do my best to answer all of them. If you need to purchase Rockwool Cubes, Amazon usually has the best prices. The same applies to pH up/down adjustment solutions.